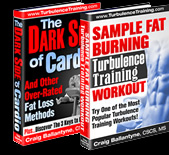 Grab your free sample Turbulence Training workout here! Reduce stress and have more productive workdays. Change your lifestyle and improve your health. Visit www.TurbulenceTraining.com for more fat-blasting workouts.